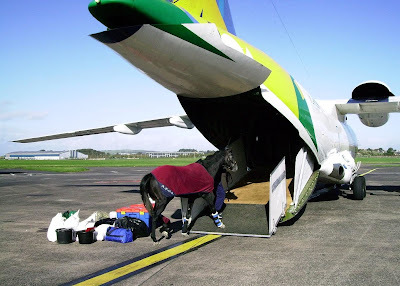 WORKING in conjunction with the owners of Ayrshire's Glasgow Prestwick Airport, Infratil Airports, the Prestwick division of Hellmann Worldwide Logistics has been building on its success in the handling of horses imported into the UK. In fact, Hellmann Prestwick has developed such a hassle-free and thriving service for importers that it is now looking set to be rolled out across Hellmann Worldwide Logistics UK. The international equestrian industry is big business, especially when it comes to importing and exporting animals for trade, pleasure and major sporting events such as racing, dressage, show jumping and eventing. With the UK being a major influence in this industry, imports into the country are high. However with only four Equine Border Inspection Posts (BIPs) equipped to handle the arrival of horses into the UK, the market is highly competitive. The equine BIP at Prestwick is also the only one based in the north of the UK. As a result, it is seeing a rise in horses being imported, in particular from the USA. Over the years, Hellmann has gained a high level of expertise and experience in dealing with equine imports and now manages approximately 90 percent of imports that come through the Glasgow Prestwick equine BIP. This has enabled the logistics firm to create strong working relationships with the US exporters, with shippers, and most importantly, with the UK importers. The overriding benefit is that Hellmann can handle all Customs and Department for Environment Food and Rural Affairs (DEFRA) regulations from the Prestwick office, which reduces any additional expense for the importer. Now Hellmann, alongside Infratil Airports, is looking to build on this success with plans to develop an equine BIP facility at Kent International Airport, which is also owned by Infratil, on the table. Hellmann Worldwide Logistics is one of the largest privately owned and family run logistical global networks, currently employing over 16,500 dedicated people to serve customers worldwide – and operates from 443 branches across 157 countries. Hellmann’s UK network has 10 individual offices based throughout the country including state of the art corporate headquarters at Fradley Park in Lichfield, Staffordshire. There are currently 265 Ayrshire business stories permanently archived on this site. To locate those of most interest to you, please use the site search facility in the top left hand corner of this page. Type your search term in the white box, then click "SEARCH BLOG".